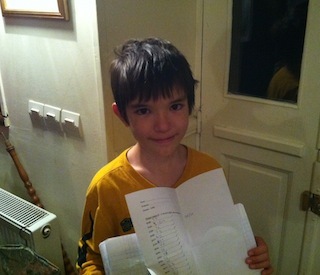 Brian writes: We live in France, where our son is in the equivalent of the fourth grade. They do things quite differently here in France than they do in the United States and Canada (where Yvonne and I are respectively from)… it’s interesting to see our children experiencing all of the many differences, and comparing the effectiveness of what people do here to what people do over there. One thing that seems pretty constant is the use of that well-known grid of multiplication equations known by almost everyone as the times tables! Both Yvonne and I had to go through several rounds of practicing and testing on these tables, and our son is no exception to the rule. Last week his class started to take daily tests on their times tables… they started at the 2x tables, then the 3x, 4x, and have since progressed to the 11x tables. They need to answer 20 random multiplication questions in the space of a minute and twenty seconds. Apparently they’re going to be doing these tests for the rest of the year… they’re really drilling these multiplication equations into the students. The thing is… these times tables quizzes work. At first our son was quite stressed out by having to take these daily math tests, but now he seems to enjoy them… he’s been getting 20/20 on them since he mastered his times tables, and in fact he’s made a game of seeing how quickly he can complete all of the 20 questions before the minute and twenty second time allotment is up (I’m not sure if this is a good thing or a bad thing). Because of these initially stressful quizzes, our son can now very quickly snap off an answer when you ask him “what’s 7 times 8?” or “what’s 6 times 9?” – an extremely useful skill to have as he progresses with his learning of algebra, geometry, trigonometry and even calculus. Knowing your times tables is always useful. 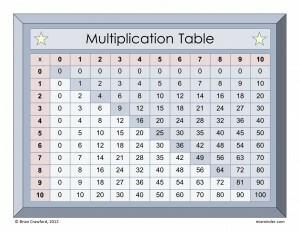 Here’s a free multiplication table that I created that you can distribute to your children or students to practice their times tables. I’ve also supplied a tool that I whipped up to help students use the times tables… I’ve included instructions on how to use it, but if you can’t figure it out, please feel free to write me a note and I’ll help where I can. Regardless, the times tables page is useful, and I highly recommend you get your students of times tables age working on memorizing those equations! I promise it will help them down the line – knowing my times tables certainly helped me get through elementary school, high school and college!